In our Virtual Power Plant we connect thousands of decentralized electricity producers and consumers. By intelligently controlling supply and demand, we competitively trade power on different markets and help to keep the grid stable. We are the first Belgian company operating a Virtual Power Plant in Belgium. By intelligently controlling the supply and demand side, we valorize flexibility of independent generators, consumers, and BRPs on different markets. It goes without saying that we are continually developing new solutions that adapt to the ever changing demands of the energy market. By utilizing the full potential of digitalization, we network thousands of energy-producing and energy-consuming units in our Virtual Power Plant. In order to control these units and maximize the revenue from their flexibility, we have developed cutting-edge algorithms. 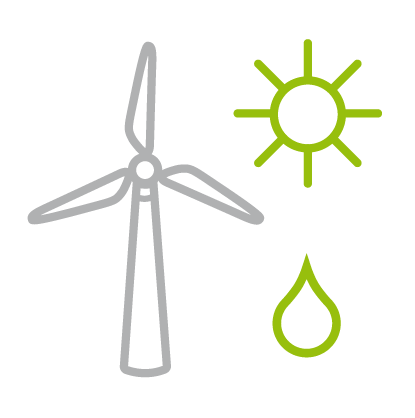 We trade the aggregated power from our Virtual Power Plant on long-trem, short-term, and reserve power markets. This way, we create new sources of income for all participants of the Next Pool and minimize the risk of blackouts in Belgium. As an energy producer you can significantly increase the profitability of your plant by joining our Next Pool. We offer a wide range of products and services for utilities and BRPs. Discover now our complete portfolio. With our Virtual Power Plant we prove that renewable energy sources are not only the right choice ecologically, but also economically. By successfully managing supply and demand we trade our clients energy when it is most profitable for them. In the long run, the core of our energy systems will consist of wind and solar power. Other power producers and consumers will need to compensate the fluctuating feed-in. By networking different types of renewables in our Next Pool this is already happening today. An energy supply based on weather-dependent energy sources needs to reliably balance fluctuation. This is exactly what our Virtual Power Plant is designed to do. On a cloudy day with little sunshine our aggregated biogas plants pitch in and increase their production. On a day with more wind than expected our networked consumers consume more power and benefit from lower prices. Learn more about the Belgian and European electricity system and markets. Take control of our Virtual Power Plant in our simulation game Next Frequency!